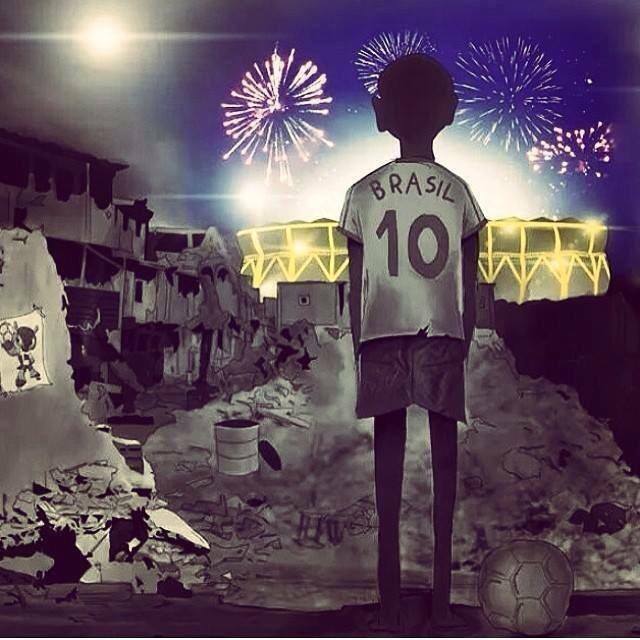 “El Otro Mundial” (The Other World Cup) – shared by Hassam on Facebook. Here in our rural hideaway we’re pretty removed from all the World Cup preparations. The shops are all selling yellow and green t-shirts, hats, and vuvuvelas and everyone is staking out their favorite place in front of a big-screen TV, of course. Mr. Crônicas is lining up a back-up plan for when the satellite dish decides to play its tricks and malfunction mid-game. But other than that it’s life as normal around here. Since all the Brazilian games are in the late afternoon, it’s likely that most stores will remain open and not much will feel different. In today’s morning newscast there was a piece about how the Belo Horizonte bus station has been updated to receive tourists in three languages: Portuguese, Spanish and English. Now THAT’S interesting. Up until now we’ve traveled the eight hours to Belo Horizonte to meet visiting relatives because while the airport is beautiful, modern, and very manageable, until recently the BH bus station has been unnavigable for anyone not fluent in Portuguese. Here’s the newscast if you’d like a glimpse. It’s a good summary of the themes swirling around the World Cup. The bus station is in disrepair. The station’s roof is leaking (they say they’ll have it fixed by the time the World Cup happens), and the escalator isn’t working (because the needed part is no longer in fabrication). Detractors will highlight that meanwhile the new Minerão stadium in BH cost 695 million reais, coming in at nearly twice its original budget of R$426 million. They say it would have been nice to use a bit of that money to improve infrastructure that Brazilians use heavily on a daily basis–e.g., the bus station. Proponents will highlight that the stadium was ready on-time (unlike other stadiums in other states that are on an all-nighter crunch to be done by the time the games start), and it is already being used for other, big-name events, bringing extra revenue to the region. Back at the bus station, the newly placed tri-lingual signs are adequate and adorable in their stilted English: “elevator” in Portuguese was translated using the British “lift” (what do they say in Australia? Maybe we Americans are out-numbered after all) and they translated “Guarda Municipal” literally– “Municipal Guard.” I’m not sure I’d know what to do with that if I were a traveler, and I’m pretty sure I wouldn’t know to seek them out if my bags were stolen! Brazilians are endeavoring earnestly to get literate for the Copa, but it may just be a case of too-little, too-late. What do I feel about all this? My family has joked for a while that I should dust off my old resume and that I should place myself in the BH bus station with a t-shirt and some brochures that announce “Interpreter” and make some easy money during the World Cup. Maybe they’re onto something. Just those signs isn’t going to solve much. As for the Minerão, I’m glad that we have a new venue closer to us than São Paolo or Rio, but any sane taxpayer would choke at the pricetag. Whoever signed off on that has a lot of explaining to do. And the bus station? While there may be new signs, it’s still got tons of pickpockets. The World Cup monies didn’t go towards to solving that particular problem. So, we’ll still be meeting our family at the airport.